It’s the last day of March. I am out of grocery money, so instead of going over budget, I didn’t go grocery shopping yesterday (Monday) like I normally would. I can’t remember the last time I didn’t get my groceries on a Monday. It was fun to skip it! I went to Village Thrift instead, where I found some shorts and a bathing suit for my oldest, and a cutting board, which I’ve been needing. In total I got 8 items for $24. Some things were on sale. Also stopped at my mom’s house and came away with a can opener and a large pot for cooking pasta — she had doubles, and I was in need of both. So back to the food: now we have to eat up what we have. I made gravy on Sunday and had my parents over to eat. 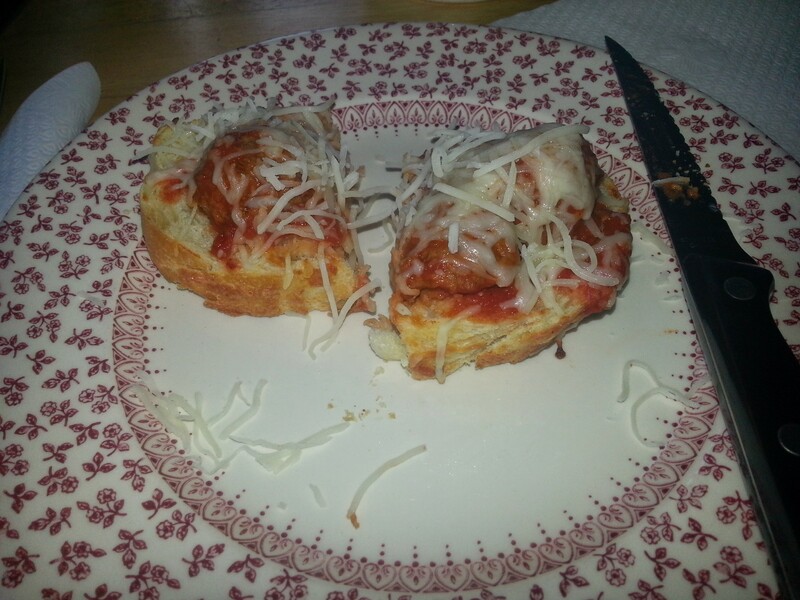 For last night’s dinner, the kids had chicken nuggets and leftover spaghetti, and I made open-faced meatball sandwiches with leftover gravy, meatballs, Italian bread, and a bag of shredded Italian cheese (6 cheeses) that was in the fridge. Yum yummy. We also have been eating up the strawberries that my mom brought over for dessert Sunday (and, in lesser quantities, the pound cake). So, nobody is starving over here. We do have a fair amount of food in the house. I made sure to buy some milk and fruit on Sunday, with the very last of the budget. It’s just a matter of making smart use of what is here. Eating strategically. The number one priority was to make sure I had stuff for the kids’ lunches. Really, I should see if I can get through to next Monday without food shopping. Now that would be an accomplishment. I’m feeling extra motivated because we have a deficit for March. Gah. We had an expensive heater repair, and dentist bills, and there was the deficit from February that I carried over to March. If I don’t count that February deficit, we were only short by $300, which isn’t too bad. And I probably shouldn’t count that deficit — I should just take money out of savings and settle it — because it’s unlikely that general scrimping and saving in any given month will be enough to take care of it. If that makes any sense. In “my” categories, we were right about on target (miscellaneous, groceries, eating out). My son decided he wanted to play flag football. He was really excited about it, which was cool. ($30 to register, on Sunday.) I got my hair cut. It looks awesome and I feel so much lighter ($45 plus tip). Not coincidentally, I find myself looking at houses for sale again. I just would love to be in a situation where I could do the frugal thing and actually see the results in my bank account, and also splurge occasionally and not feel guilty. That means slaying that beast of a mortgage, and its sidekick, the evil property taxes. But we’ll see. I mentioned moving to my oldest the other day, and he got all teary-eyed, so I back-pedaled right off the subject. Yesterday and today I was trying to pull together Easter clothes for the kids. My oldest just needed khakis, and I found them at Village Thrift. Last year my neighbor gave me a giant bag of boys’ clothes ranging from size 10 to 14. I need to thank her again when I see her, because they are in great shape and are great brands. I pulled a nice dress shirt out of there for him. My younger son has plenty of hand-me-downs to choose from. Then there’s baby girl… After searching Village Thrift and the Nesting House, and looking at a zillion dresses online and wondering if they would arrive in time for Easter, I dug up a $15 gift card I “earned” from Babies R Us that was expiring today (and a 20%-off coupon). She and I went there, and I picked up a dress, tights, sandals, and summer pajamas for $28 out of pocket. Not too bad. The dress is not fancy, but I had the brilliant idea to put one of her many tutus under it to give it a little oomph. We’ll see if that works! I might take the pajamas back. I think pajamas are an invention of the bourgeoisie. Can’t she sleep in an old T-shirt? I should have gone straight home after that, but I was starving, so we ate at Panera ($15), and then went to Barnes and Noble, because I had a gift card there that was actually for my daughter from my aunt. I thought it had the full amount on it. It did not! Lesson: always call and check the balance. I also got a really horrible tasting tiramisu-flavored latte at Starbucks. Oh well. Hopefully those mistakes will post as April 1 instead of March 31. Tomorrow would be a good day for me to get some candy for their baskets. I also have to paint, since I didn’t over the weekend.